The Meteorology, Climatology and Geophysics Agency (BMKG) plans to expand its coverage and service areas in Papua. The statement was delivered directly by BMKG Head, Dwikorita Karnawati, during the Regional Coordination Meeting (Rakorwil) Central Meteorology, Climatology, and Geophysics (MKG) Region V Jayapura, Aston Hotel Jayapura on Monday (16/4). 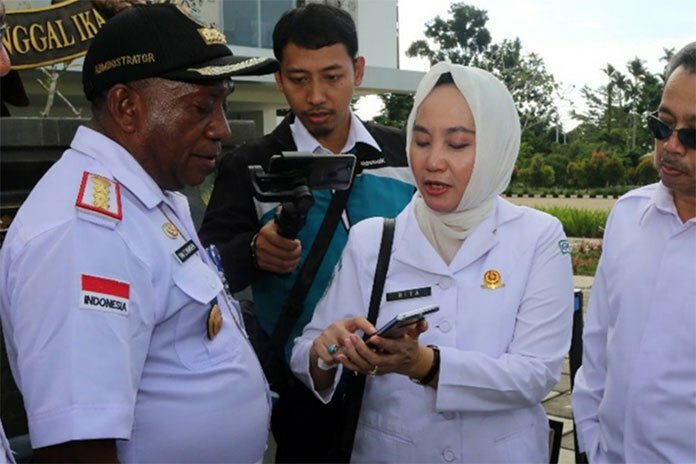 Dwikorita convey, the expansion of the coverage area is a manifestation of the commitment of his party in carrying out the vision in Nawacita President Joko Widodo (Jokowi). "The focus of this year's BMKG program is to improve the quality of Meteorology, Climatology and Geophysics services to guide infrastructure and transportation development in Papua This program is a form of BMKG support to one of the visions in Nawacita, which is to build Indonesia from the border region," said Dwikorita in press release received on Tuesday (17/4). Dwikorita explained, it will run several priority programs. This year, he added, BMKG will build a weather radar at Wamena Airport, complementing five other weather radar already built at DEO Sorong Airport, Frans Kaisiepo Biak Airport, Jayapura Sentani Airport, Timika Airport and Merauke Airport. "The radar can increase the accuracy of weather information and is useful for improving transportation safety, the reference in the development of infrastructure and public weather guidelines for the community," he explained. Dwikorita added, in addition to weather radar, BMKG will add one weather display at Frans Kaisiepo Biak Airport. In addition, equipment for the earthquake has also been added with seismograph sensors at the location of Enarotali, and will be rejuvenated earthquake equipment in Biak and Wamena. "In addition, BMKG will expand the range of Automated Weather Observing System (AWOS) at 12 airports, namely Kepi, Babo, Bintuni Bay, Inanwatan, Teminabuan, Bilorai, Ewer, Ilu, Numfor Biak, Tanah Merah, Enarotali and Ransiki airports. According to Dwikorita, his side is optimistic to provide accurate information to the community in the border area. BMKG, he added, has also prepared a videotron at the State Border Cross (PLBN) in Skouw, Jayapura. The videotron will contain information from weather radar. All instruments ranging from radar, display, AWOS and videotron along with their networks, will be connected digitally to big data analytic and artificial intelligent (AI). "Thus, disaster warnings will be detected more rapidly, wider detection range and accurate accuracy of information.With improving the quality of services, people in border areas can be more responsive to disasters," he added. Meanwhile, Skouw Cross Boundary State Administration (PLBN), Yan Z Numberi, stated that his party expressed his appreciation and gratitude to BMKG good intentions in improving the quality of its services.